After assignment of the Eocypselidae and Aegialornithidae to stem group Apodiformes (see Sects. 12.7.1, 12.7.2), the Hemiprocnidae have no Paleogene fossil record. The earliest stem group representatives of the Apodidae occur in the early and middle Eocene of Europe and belong to the taxon Scaniacypselus. Scaniacypselus wardi from the early Eocene (MP 8; Mlikovsky 2002) of Denmark was described by Harrison (1984b) and is known from wing bones of a single individual (Fig. 12.8). A second species, S. szarskii (Peters 1985), is represented by several skeletons from Messel and a humerus from the middle Eocene (MP 10/11) of the Quercy fissure fillings (Peters 1985; Mayr and Peters 1999; Mourer-Chauvire 2006). A record of Scaniacypselus sp. also comes from the late Eocene (MP 17) of Quercy (Mourer-Chauvire and Sige 2006). S. szarskii was erroneously assigned to the Aegialornithidae in the original description, from which it differs, among others, in the more abbreviated humerus and ulna (Mayr and Peters 1999). In fact, S. szarskii is quite similar to extant Apodidae in skeletal morphology, with whom it further shares a derived humerus morphology. 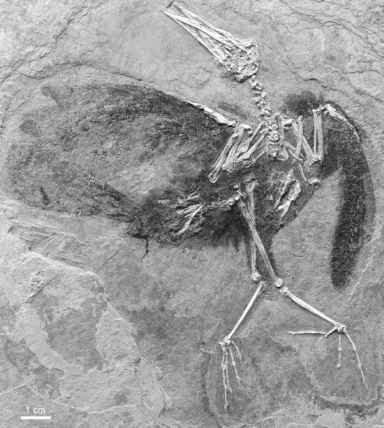 Some Messel specimens of this species exhibit an excellent feather preservation, which gives a vivid impression of the external appearance of these birds in life (Fig. 12.10). In contrast to that of many extant Apodidae, the tail of S. szarskii was only slightly forked. A proximal ulna of a true swift from the late Oligocene of France was assigned to Procypseloides cf. ignotus (Milne-Edwards, 1871) by Mourer-Chauvire et al. (2004). 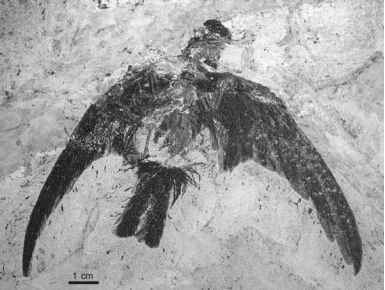 Boles (2001a) described a swiftlet (Collocaliini), Collocalia buday, from the late Oligocene/early Miocene of the Riversleigh Formation in Australia. This species is known from humeri, a coracoid, and a tarsometatarsus, and is larger than extant species of Collocalia. If correctly identified, this species would constitute the earliest record of crown group Apodiformes.